Marketing automation is a powerful tool for lead generation and nurturing. According to the tech research firm Forrester, automation will continue to permanently change the ways businesses engage with customers in 2018. By using a digital platform with marketing automation features the right way, businesses can attract more new prospects, strengthen customer relationships, and accurately determine their marketing ROI. However, it’s counterproductive and problematic when marketers misuse automation tools with false hopes about their capabilities. Whether you consider yourself a pro or you’re just getting started, it’s helpful to be aware of these 6 common reasons why businesses run into problems with their marketing automation efforts. 1) You’re using automation as a strategy, not a tool. Marketers fail when they rely on automation technology before refining their process of attracting new prospects and nurturing leads. Automation should be used to streamline the steps of your marketing strategy so you can make the greatest possible impact with your efforts. Although it does increase your efficiency and save you time, marketing automation isn’t a shortcut. A common misconception is that automation tools allow marketers to get away with doing less strategy work. Unfortunately, problems are inevitable when people try to use marketing automation to fix processes that are already broken. Solution: You can’t be in denial of the gaps in your inbound marketing strategy and expect automation to help you.If you’re having issues, re-evaluate your marketing strategy by working backwards. It might seem obvious, but even the most perfectly planned drip email campaign won’t succeed if the content isn’t valuable to the target recipient. Maybe you need to produce better content. The bottom line is you have to fix the glitches in your system before you start using automation tools. 2) You’re misusing email automation. With the right strategy, email marketing continues to be one of the most effective digital marketing channels. However, misusing automation tools by sending mass email blasts will only create more problems. You’ll lose customers’ trust, experience lower engagement and click-through rates, and you’ll probably end up in someone’s spam folder. It’s disappointing that some companies are still wasting their database full of qualified leads by using automation software to blast out emails that aren’t customized. As Forrester’s research points out, customers expect fast, personalized experiences and don’t have patience for irrelevant messaging anymore. Solution: Email marketing tactics are evolving rapidly to meet the demands of modern consumers, and you need to keep up. Segment your email lists and avoid impersonal messaging at all costs. With a data warehouse, you can use predictive marketing analytics to help you send the right messages to the right prospects at the right time. Successful automation helps you retain your best customers, attract new prospects, and nurture leads that are not sales ready yet. Use email automation tools the right way, and you’ll reap the benefits. 3) You don’t fully understand your data. In this competitive world of digital marketing, you won’t succeed if you aren’t proficient at breaking down your data. Many marketing automation programs rely on having accurate customer information. It will be painfully problematic if you can’t interpret this information (and make sure it’s right). The bottom line is that you need to be able to recognize incorrect or inconsistent data. Not only is poor quality data a liability for your company, but it will also decrease the overall effectiveness of your programs. Solution: Find a digital marketing automation platform that makes your customer data and campaign results easily readable and digestible. Once you find a platform that clearly organizes the relevant data of your marketing efforts, you can start making sense of the analytics. For example, the Chainlink Marketing Platform empowers marketers to view data on visually appealing dashboards and integrate them with other marketing initiatives like social media campaigns. With a robust data warehouse, the Chainlink Marketing Platform allows you to convert data from multiple sources into a common format to help verify the consistency and quality of your customer data for marketing purposes. 4) You didn’t do enough research or budget appropriately. The root of many marketing automation problems is a lack of budgeting and due diligence. People lose money when they don’t spend enough time researching what digital marketing solutions will be best for them, and then purchase access to a platform they can’t use properly. Investing in a digital platform to automate your marketing processes can be extremely empowering, but only if you do your research and take the time to learn how to use it. Solution: Gather data from credible sources in the digital marketing community (there are endless free resources) to help you determine how much to spend on marketing, and where to focus your financial investment. 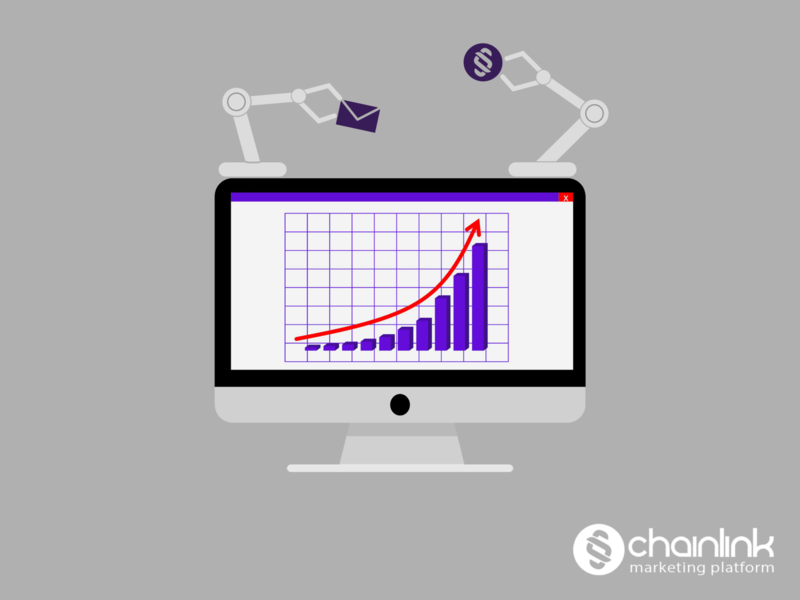 Automation can help you achieve amazing results by integrating email marketing, social media, and content marketing efforts. 5) Sales and marketing aren’t working together. Another root issue of ineffective automated marketing processes is a disconnect between sales and marketing. This disconnect is inevitable when these two departments don’t collaborate to clarify their lead generation process and define the company’s ideal customer journey. Any lack of communication between departments, particularly in big companies, is detrimental. Everyone needs to be on the same page about the customer data and marketing automation tools being used. Sales and marketing alignment should be a key initiative for all organizations. Solution: Organize a meeting for the marketing and sales departments to define what is a marketing qualified lead, what is a sales-accepted lead, and the difference between the two. Figure out which department is responsible for which interactions throughout a customer’s journey. Discuss and decide on processes for lead follow-up. Use a common language when talking about data, metrics, and reporting success. Agree on a time to meet, ensure lead quality and adjust strategy once or twice a month. By building a bridge between sales and marketing, you’ll bring in more leads and achieve your common goal: to boost the company’s bottom line. 6) You’re too focused on selling and not nurturing. Automated marketing efforts that don’t offer value to recipients are rarely effective. Your contacts will sense a pressured tone in a sales pitch right away. When automated messaging is more sales-focused than conversational, it becomes painfully repetitive and pressure-inducing. On the other hand, if you aren’t pushy and offer your contacts free, valuable content gradually through a drip campaign, you’ll lay a foundation for success. Solution: Change your focus from selling to nurturing. People won’t buy unless they’re comfortable with the sales/marketing process and they’re convinced of the value of the product or service. Nurture leads by sending some useful information (guides, case studies, video tutorials, etc). In other words, re-frame your marketing/sales strategy as one focused on relationship building rather than closing more sales. With the right goals and platform, marketing automation can create plenty of valuable opportunities for your business. The key is to know that the automation technology won’t create the strategy for you. Once you’ve spent time, money and valuable resources on a digital marketing platform, you need to strategize before you implement. Chainlink Marketing Platform’s powerful marketing automation tools are designed with customized editions for both B2B and B2C marketers. Our goal is to help B2B marketers build their funnels with qualified leads to close more deals, and to help B2C marketers better engage with their customers by providing personalized content and messaging. Each edition was built with the same higher-level purpose: to understand your customers/prospects, drive higher engagement, and maximize your marketing budget. Want to learn about how to unlock more information about your leads and customers than you ever thought imaginable? Sign up below to request closed beta access to the Chainlink Marketing Platform today.